Here are a few organizations where you can volunteer and help others in need! Every year Preferred Airparts offers it's employees an extra paid week of vacation to use for a mission trip. Many of the Preferred employees take full use of that week and go on many wonderful trips helping others all around the world! Below are a few examples of some of the trips our people have made. Bringing back stories and photos to share with others in our shop and community. The owners of Preferred Airparts know that these trips are as important for their employees as they are to those they are helping. God calls us to serve, where we live, and abroad. Hopefully the stories on this web page will show you first hand that every single person can make a difference to those in need. Preferred Airparts owner Brian Stoltzfus flies a DC-3 doing food drops to refugees who are fleeing the fighting that has broken out in the Nuba mountains in Northern Sudan, Africa. Brian is a part of Samaritan's Purse relief efforts of the people fleeing to South Sudan. 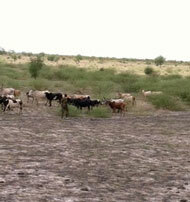 These people are fleeing their own villages, only to face the harsh environment surrounded by swamps! Before SP learned of these people they faced starvation resorting to boiling grass and drinking the water to get any nutrition they could. Watch the videos here to get a better understanding of the needs of these people. The week of March 12-16, 2012 Justin Starett, Tom Romey, and myself had the privilege of going to Tuscaloosa, AL to help build new homes and remodel homes that were damaged by the devastating tornado that hit the area on April 27, 2011. 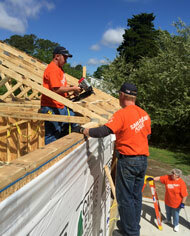 We had the opportunity to work hands on with Samaritan’s Purse in this rebuild effort. I was very impressed with what a professional organization SP is. The first two days we worked on remodeling the home of Mr. and Mrs. Snoddy. Their home was heavily damaged and unlivable after the tornado, and they have been displaced for over a year. It was awesome to see their excitement about being able to move back into their home very soon. The next two days we started new construction on a home that will be lived in by Ms. Virginia. Her home was completely destroyed by the tornado. 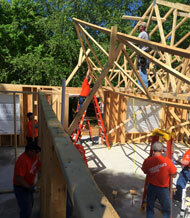 In just two days we had most of the framing completed. Because the new homes do not have basements, Samaritan’s Purse builds a safe room in the middle of each house. The safe room doubles as a bathroom, but has solid block walls and a concrete poured ceiling. It is a great design to help protect the family from any future natural disasters. It was a great trip, I learned a lot, and it was awesome to share Jesus' love with these families. In June of 2011, my wife and I had the opportunity to minister to the people of Garca, Brazil. We took a group of 7 adults and 34 teenagers from our youth group at West Hill Baptist Church. We ministered in schools and churches in that area through drama, music, and testimonies. It was an awesome time of sharing the Gospel of Jesus Christ with thousands of Brazilians. As this was our fourth trip to Garca, it was also a time of nurturing relationships we had made in the past. One highlight of our trip was meeting the town mayor and spending time with him and his family. They even came to our last church service. Please pray for the people of Brazil, and the churches we were able to minister with. In June of 2010, my wife and I took a group of teens to Jamaica to share the Gospel of Christ. We spent the first day ministering at the local orphanage. We helped make beds, held vacation bible school, and spent time loving on the 70+ orphans at the home. It’s great to see how loving kids that have nothing can affect our own teens. The rest of the week was spent at Victory Christian Fellowship Church. We moved gravel and sand, painted, cleaned, and poured a second story floor by hand. With the temperatures in the 90s and humid, this made for a very hot job. We did take a break each afternoon to do vacation bible school for the pre-school at the church. We did skits, games, crafts, snacks, and shared Christ’s love with them. What an awesome experience! Throughout the week, we saw 38 people come to know Jesus Christ as their personal savior. We continue to pray for the people of Jamaica, and also for our teens that were impacted through this trip. Tom Romey is an employee that has been on many different mission aid project all across the U.S. for a number of year. Below is some of the places he has made a difference by helping those in need. Rebuild homes after flood. Tom, his wife Sherry, and another Preferred Airparts employee Jason all went on this trip. Re roof a home and built a handicap ramp. Help load semi trailers with new medical equipment for Honduras. There are 4 to 6 trailers a year! Recently I was given the opportunity to go out and help serve with ATS and Samaritan's Purse in Long Island NY. It was a rebuild effort after Tropical Storm Sandy hit the coast over a year ago. A total of 8 of us got to go with the group and 3 were from right here at Preferred Airparts. Justin Starrett, Tom Romey, and Dan Head. 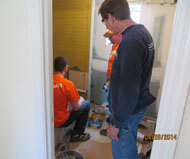 While we were there we got to work on tiling an entire bathroom from start to finish. It was very rewarding to know that we completed this task in His name and in pretty fair time. We got to do a lot of finishing work on the house as well, but the main project for my smaller group was the bathroom. The other team members went to work at a Church a couple blocks away that was also filled with water from the storm. They were hanging doors and trim and painting. They were also making very nice fixtures around some rounded windows. Overall it was a great opportunity to go out and help those who were in need and do some great work with even better people. I wanted to thank the Stoltzfus's again for giving me the opportunity to go out and do this all over the country to whomever is in need. Our team left from Countryside Chapel with a mission to support and encourage the Thomas family. We spent six day in Eldoret, which gave Nate a good reason to take some time off work. The team helped with various tasks, like working with a pastor from Calvary Chapel and visiting a Kenyan orphanage/boarding school. 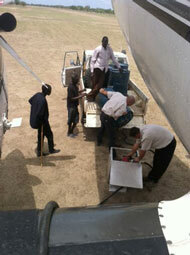 I was privileged to the fly relief in the DC-3 with Brian in South Sudan. The team felt we accomplished what God had sent us there to do. Dan Head and Corey Chupp went on this mission trip with ATS. ATS partnered with Samaritan's Purse to send a group of people to Tarboro, NC. while in Tarboro, SP is building homes for people that were affected by the floods caused by hurricane Matthew. 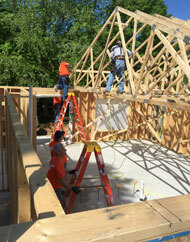 This specific ATS group helped put a roof on a house. This consisted of trusses, sheeting, and tar paper. They also helped out at a host church for SP by creating walkways, doing some plumbing, and electrical work as well as cleaning up around the church.